The new Swingline EasyBlade Plus Rotary Trimmer makes trimming photos, labels, posters, banners, paper, or nearly anything else a breeze. The innovative blade for the Swingline EasyBlade Plus features an indicator light that changes from green to red when you need to change the blade. 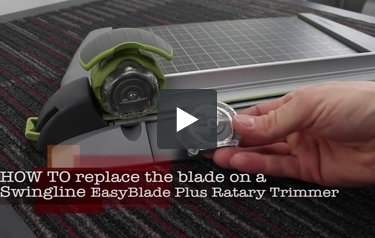 These replacement blades make changing the blade for the EasyBlade Plus Rotary Trimmer easier than ever. Contained within a cartridge to prevent accidental cutting and for safety, this replacement blade makes it simple to change in order for you to keep on trimming. Welcome to MyBinding video. This video is designed to answer the question “how do I change the blade on my Swingline EasyBlade Plus Rotary Trimmer.” When as simple as the name implies and whether you just open the blade of you have them stored here in this compartment, it’s as simple as pressing, pulling, and snapping back in place. On the sides of the blade cartridge are two push tabs. Squeeze them in and it pops out, squeeze them in and it pushes right in. It really is that simple. For more demos, reviews and how-to’s, check out MyBinding.com. Plus Rotary Trimmer - 8913RB-Will this work on my EdgePro flat paper cutter? Thank you for your question. The Replacement Blade for Swingline EasyBlade Plus Rotary Trimmer was designed to specifically be used with the SmartCut EasyBlade Plus Rotary Trimmer and would not work with a EdgePro paper cutter. Will the 8913 RB cartridge work in the 8812 Model Trimmer? Yes or No? The blade will work in the 8912. I need an 8813RB Swingline Replacement Blade Cartridge for a Smart Cut Swingline Model 8812. I haven't been able to find this exact cartridge, will a different one work?